Dark purple with burgundy highlights. Amazingly deep, rich, and complex blackberry notes with a touch of cassis and soy sauce. Complex and layering in the mouth with a lingering and rich fruity aftertaste. This Cabernet is such a showcase for our fruit forward Cabernet clones that we felt it deserved to be showcased in its own bottling. This 2010 Cabernet Sauvignon was barrel aged for 22 months in French oak and is composed of 97% Cabernet and 3% Petit Verdot. 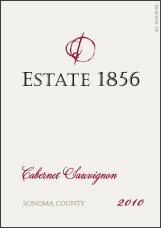 FOOD PAIRING NOTES: This Cabernet would best complement a main course of flavorful red meat, surrounded by a rich, complex sauce. We suggest Cabernet Braised Shortribs with Gorgonzola Polenta.